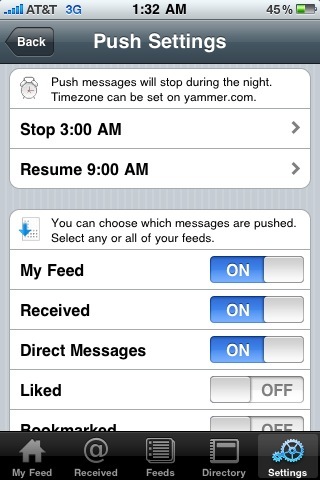 It seems like we’ve all been waiting forever for the new version of Yammer’s iPhone app, version 2.0. And we really have, it had been about a month and a half since we announced it was sitting in the App Store, waiting approval. But today, finally, it’s here — and it’s great. The big addition here is Push Notifications. This is really a key feature since you now can see whenever someone in your network says something without having to open the app. And there are Push settings to allow you to see all messages, replies to you, direct messages, “liked” items, bookmarked items, events, and editorial items — and combinations of any of those. You can also set whether or a not a sound plays when the notification comes in (it seems to say “Yam”), and set “quiet” times; times when you don’t want to get any notifications (such as at night). The app remains free. If you use Yammer and have an iPhone, this is clearly a must have. You can find it here.